Int J Cancer, 2018, 142(5):999-1009. DAPT (GSI-IX) purchased from Selleck. Western blotting showing increased unconjugated SUMO1 levels in Notch1 ΔE cells treated with 10 uM DAPT for 3 days. Tubulin was used as a loading control. Oncogene 2014 10.1038/onc.2014.319. DAPT (GSI-IX) purchased from Selleck. Upper; Effect of DAPT, a Notch inhibitor on Notch4-ICD expression in TAMR-MCF-7 cells. Lower; Effect of DAPT on cell proliferation of TAMR-MCF-7 cells. Cells were exposed to DAPT (0.3-10 μM) and cell proliferation was measured at different time points by MTT assay. Data represent mean ± SD with 6 different samples. cancer lett, 2017, 390:115-125. DAPT (GSI-IX) purchased from Selleck. Representative E-cadherin staining in MCF-7 and TAMR-MCF-7 cells. A panel of GICs was treated with the indicated doses of DAPT for 48 hours. γSecretase inhibitors inhibited expression of NICD, Hes1, Hes3, and Hes5 in a dose-dependent manner. Stem Cells 2014 32(1), 301-12. DAPT (GSI-IX) purchased from Selleck. (E) Western blotting analysis shows DAPT decrease HES1, ALDH1, BMI1 and SOX2 expression in HNSCC CAL27 cell line. Sci Rep, 2016, 6:24704. DAPT (GSI-IX) purchased from Selleck. Effects of endosulfan on cytoskeleton and mitosis in HUVECs. Images 7–12 are the 4 × magnified versions of 1–6, respectively. Microfilament (A), microtubule (B), and cell nucleus (C) were incubated with Actin-Tracker Green, Tubulin-Tracker Red, and Hoechst 33258 solution, respectively. Environ Pollut, 2017, 221:26-36. DAPT (GSI-IX) purchased from Selleck. R26PR;cre tumors express high levels of NICD and are sensitive to pharmacological inhibition of NOTCH1 signaling. (C) A cell line derived from R26PR;MMTV-cre tumor cells was cultured in the presence of a γ-secretase inhibitor, DAPT, or DMSO vehicle. Live cells were counted at 24, 48 and 72 hours of culture. (D) Western blot analysis of NICD following DAPT treatment. Dis Model Mech 2013 6(6), 1494-506. DAPT (GSI-IX) purchased from Selleck. Human corneal epithelial cells were subjected to a scratch assay and then treated with DAPT or DMSO (control) (A). The effect of DAPT concentration on scratch assay wound closure rate was measured (P < 0.001) (B). Western blot for Notch1IC confirmed that 10uM DAPT can effectively inhibit Notch activation (C). HCE-T cells pretreated with DAPT migrated 2.2 times faster than control in transwell migration assay (P < 0.0001) while Jagged1 treated cells migrated 20% slower but did not reach statistical significance (P =0.077) (D). Invest Ophth Vis Sci 2012 53,12 . DAPT (GSI-IX) purchased from Selleck. Human embryonic kidney cells (American Type Culture Collection CRL-1573), transfected with the gene for APP751 (HEK 293) are used for routine Aβ reduction assays. Cells are plated in 96-well plates and allowed to adhere overnight in Dulbecco's modified Eagle medium (DMEM) supplemented with 10% heat-inactivated fetal bovine serum. DAPT are diluted from stock solutions in dimethylsulfoxide (DMSO) to yield a final concentration equal to 0.1% DMSO in media. Cells are pre-treated for 2 hours at 37 °C with DAPT, media are aspirated off and fresh compound solutions applied. After an additional 2-hour treatment period, conditioned media is drawn off and analyzed by a sandwich ELISA (266–3D6) specific for total Aβ. Reduction of Aβ production is measured relative to control cells treated with 0.1% DMSO and expressed as a percentage inhibition. Data from at least six doses in duplicate are fitted to a four-parameter logistical model using XLfit software in order to determine potency. Human and PDAPP mouse neuronal cultures are grown in serum-free media to enhance their neuronal characteristics, and appeared to be greater than 90% neurons after maturation prior to use. Conditioned media to establish baseline Aβ values are collected by adding fresh media to each well and incubated for 24 hours at 37 °C in the absence of DAPT. Cultures are then treated with fresh media containing DAPT at the desired range of concentrations for an additional 24 hours at 37 °C, and conditioned media collected. For the measurement of total Aβ, samples are analyzed with the same ELISA (266–3D6) as used for the HEK 293 cell assays. Analyses of samples for Aβ42 production are performed by a separate ELISA (21F12–3D6) that utilizes a capture antibody specific for the Aβ42 C-terminus. Inhibition of production for both total Aβ and Aβ42 are determined by the difference between the values for the compound treatment and baseline periods. After plotting percentage inhibition versus DAPT concentration, data are analyzed with XLfit software, as above, to determine potency. Method: Cells are seeded into 96-well plates and exposed to 0.1% DMSO or DAPT at concentrations in the range of 2.5 μM–160 μM for 72 hours. Cytotoxicity is determined with 3-(4, 5)-dimethylthiahiazo-(-z-y1)-3, 5-di-phenytetrazoliumromide (MTT) dye reduction assay with minor modifications. Briefly, after incubation with DAPT, 20 μL MTT solution (5 mg/mL in PBS) is added to 180 μL medium in each well and plates are incubated for 4 hours at 37 °C, and subsequently 150 μL DMSO is added to each well, and mixed by shaking at room temperature for 15 minutes. Absorption is measured by an enzyme-linked immunosorbent assay at 490 nm to determine absorbance values. α-MEM supplemented with the same amount of MTT solution and solvent is used as blank solution. The IC50 value is calculated using PROBIT program in SPSS. Animal Models: Heterozygous PDAPP transgenic mice overexpressing the APPV717F mutant form of the amyloid precursor protein. Formulation: DAPT is dissolved in corn oil, 5% (v/v) ethanol. Dovey HF, et al. J Neurochem. 2001, 76(1), 173-181. Cao H, et al. APMIS. 2012, 120(6), 441-450. Nasoohi S, et al. Neuroscience. 2012, 210, 99-109. Could you please help test the formulation of S2215 for in vivo studies? S2215 DAPT in 30% PEG400+0.5% Tween80+5% Propylene glycol at 10 mg/ml is a suspension. We tried to add some EtOH, and it dissolved clearly in organice solvents, but when water added, the precipitation went out immediately. Then we tried other vehicles, and found S2215 can be dissolved in 4% DMSO+corn oil at 10 mg/ml clearly. I would like to ask if you would recommend this product used in endothelial cells (e.g. both murine and human endothelial cells). Semagacestat (LY450139) : Aβ42, IC50=10.9 nM; Aβ40, IC50=12.1 nM; Aβ38, IC50=12.0 nM. LY411575 : γ-secretase, IC50=0.078 nM. 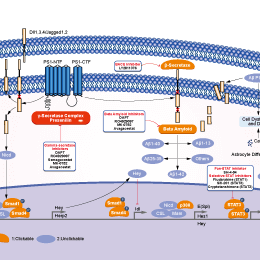 Semagacestat (LY450139) : Phase III for Alzheimer's Disease. FLI-06 New : Novel inhibitor of Notch signaling with EC50 of 2.3 μM. Features:Appears to be more “notch sparing” than semagacestat (LY450139). 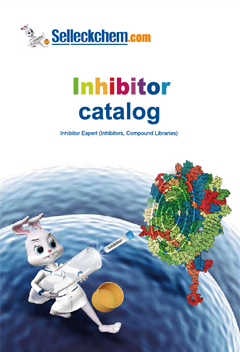 Features:The best characterized γ-secretase inhibitor that has reached the clinic. Features:A moderately potent γ-secretase inhibitor.